in violet on QV 1d pale rose (SG.29, Cat.£38.00). 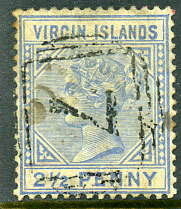 (Type 0.2) used as sole canceller on 1884 QV 2½d ultramarine (SG.31), smaller faults. 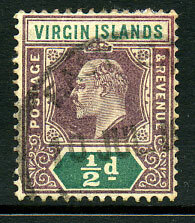 The 1883 QV issues for Arima are normally always cancelled by either the 0.9 duplex numeral datestamp or by the 0.6 numeral in diamond handstamp. 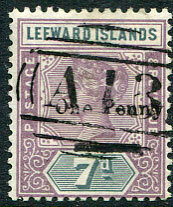 This late use of 0.2 7 is also known on Trinidad 1883 QV 1d (SG.107). This extraordinary and unusual use might suggest re-allocation to Dead Letter Office or elsewhere. (T.14) TRD in black dated 10 JUL 19-- on KE7 ½d (SG.54). Rarely available.